To enforce security in Rio, Operação Praia (Beach Operation) has approximately 850 police officers from different units in action. RIO DE JANEIRO, BRAZIL – As the city of Rio de Janeiro struggles with a financial crisis and a general security-image issue, authorities want to reinforce policing efforts focused on the tourism, and the summer high-season (December through February). The Secretary of Security, in joint action with the Military and Civil police, reinforced the service of attending to national and foreign tourists, photo by Clarice Castro/IMPRENSA RJ. The Secretary of Security, in joint action with the Military and Civil police, have increased operations attending to national and foreign tourists for the summer, that begins today, including the holiday period and New Year’s Eve celebrations. According to authorities the objective for this summer season is to provide increased human and technological resources, bringing the public closer and expanding the channels of security. Government new sources report that visitors can now access options such as emergency service application 190 (which links to the U.S. 911 and European 112 international emergency numbers), web access to the Guide to Public Safety in five languages, and qualified and bilingual service by the Policing Battalion in Tourist Areas (BPTur). Also Operação Praia (Beach Operation) has approximately 850 police officers from different units in action. The operation has technology support from two Mobile Command cars, which are based on the beach of Arpoador and Barra da Tijuca, with the military police as backup. The equipment has an image capture system with a range of two kilometers and images are transmitted by the helicopter of the Aeromóvel Group (GAM), in real time. The Policing Battalion in Tourist Areas (BPTur) will patrol along the beach of Copacabana with vehicles and bicycles, photo by Andre Gomes de Melo/IMPRENSA RJ. The BPTur police force carries out the patrol on the beach of Copacabana with vehicles and bicycles. 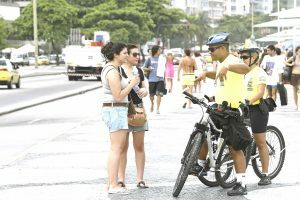 The strategic decision to focus the patrolling on bicycle on the most famous beachfront in Rio de Janeiro took into account the geography of the place, and the indication of bicycles aiding in the prevention of thefts, petty thefts and decentralized drug trafficking. Nicky Francis, a British expatriate living in Rio and partner/founder AfroNegocios.com entrepreneurial magazine, shares his thoughts. “I haven’t noticed that security on the beach has gotten worse, but the security by the beach in my opinion has gotten worse, as after the Olympics it seemed like they pulled off most of the police security,” Francis explained. If an incident occurs, authorities say that about fifty percent of Military police (Policia Milita, PM) officers have command of a second language. 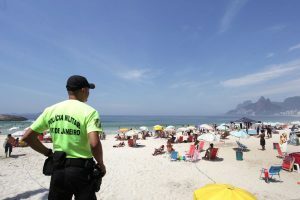 French, Korean, Italian, Arabic and Russian, as well as Spanish and English, are some of the languages ​​spoken in the Policing Battalion in Tourist Areas located in Copacabana. Tourists need to be very wary of groups of young blacks that come down from the favelas to specifically rob and steal from tourists, usually by running at them in packs, grabbing from they can.